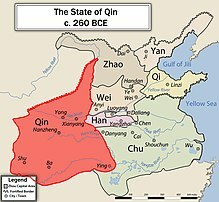 The Qin dynasty (Chinese: 秦朝; pinyin: Qíncháo; Wade–Giles: Chʻin²-chʻao²) was the first dynasty of Imperial China, lasting from 221 to 206 BC. Named for its heartland in Qin state (modern Gansu and Shaanxi), the dynasty was founded by Qin Shi Huang, the First Emperor of Qin. 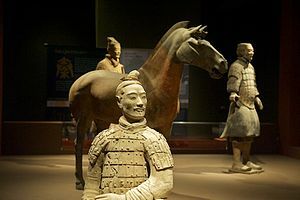 The strength of the Qin state was greatly increased by the Legalist reforms of Shang Yang in the fourth century BC, during the Warring States period. In the mid and late third century BC, the Qin state carried out a series of swift conquests, first ending the powerless Zhou dynasty, and eventually conquering the other six of the Seven Warring States. 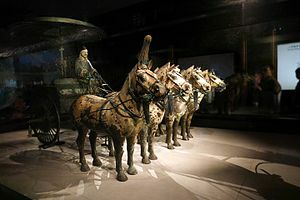 Its 15 years was the shortest major dynasty in Chinese history, consisting of only two emperors, but inaugurated an imperial system that lasted from 221 BC, with interruption and adaptation, until 1912 CE. The Qin sought to create a state unified by structured centralized political power and a large military supported by a stable economy. The central government moved to undercut aristocrats and landowners to gain direct administrative control over the peasantry, who comprised the overwhelming majority of the population and labour force. This allowed ambitious projects involving three hundred thousand peasants and convicts, such as connecting walls along the northern border, eventually developing into the Great Wall of China. 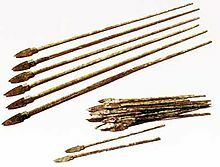 The Qin introduced a range of reforms such as standardized currency, weights, measures, and a uniform system of writing, which aimed to unify the state and promote commerce. Additionally, its military used the most recent weaponry, transportation, and tactics, though the government was heavy-handedly bureaucratic. Han dynasty Confucians portrayed the legalistic Qin dynasty as a monolithic tyranny, notably citing a purge known as the burning of books and burying of scholars although some modern scholars dispute the veracity of these accounts. Dujiangyan, an irrigation project completed in 256 BC during the Warring States period of China by the State of Qin. 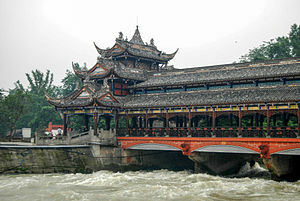 It is located on the Min River in Sichuan, near the provincial capital of Chengdu. Although a reinforced concrete weir has replaced Li Bing's original weighted bamboo baskets, the layout of the infrastructure remains the same and is still in use today to irrigate over 5,300 square kilometers of land in the region. Stone slab with twelve small seal characters. Qin Dynasty (221 – 207 BC). The 12 characters on this slab of floor brick affirm that it is an auspicious moment for the First Emperor to ascend the throne, as the country is united and no men will be dying along the road. 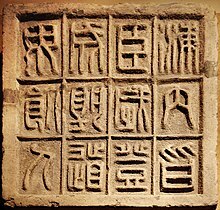 Small seal scripts were standardized by the First Emperor of China after he gained control of the country, and evolved from the larger seal scripts of previous dynasties. The text on it is "海内皆臣，歲登成熟，道毋飢人". 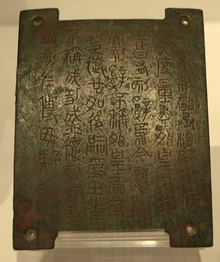 The written language of the Qin was logographic, as that of the Zhou had been. As one of his most influential achievements in life, prime minister Li Si standardized the writing system to be of uniform size and shape across the whole country. This would have a unifying effect on the Chinese culture for thousands of years. He is also credited with creating the "lesser-seal" (Chinese: 小篆,; pinyin: xiǎozhuàn) style of calligraphy, which serves as a basis for modern Chinese and is still used in cards, posters, and advertising. During the Qin dynasty, Confucianism—along with all other non-Legalist philosophies, such as Daoism—were suppressed by the First Emperor; early Han dynasty emperors did the same. Legalism denounced the feudal system and encouraged severe punishments, particularly when the emperor was disobeyed. Individuals' rights were devalued when they conflicted with the government's or the ruler's wishes, and merchants and scholars were considered unproductive, fit for elimination. Terracotta Army, museum of the grave of Qin Shi Huang. Qin warriors of the Terracotta Army. 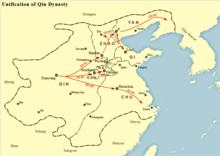 The name 'Qin' is believed to be the etymological ancestor of the modern-day European name of the country, China. The word probably made its way into the Indo-Aryan languages first as 'Cina' or 'Sina' and then into Greek and Latin as 'Sinai' or 'Thinai'. It was then transliterated into English and French as 'China' and 'Chine'. This etymology is dismissed by some scholars, who suggest that 'Sina' in Sanskrit evolved much earlier before the Qin dynasty. 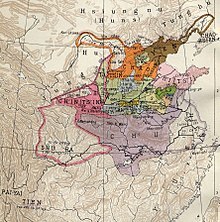 'Jin' (pronounced as 'Zhin'), a state controlled by the Zhou dynasty in seventh century BC, is another possible origin. Others argued for the state of Jing (荆, another name for Chu), as well other polities in the early period as the source of the name. Qin Shi Huang was the first Chinese sovereign to proclaim himself "Emperor", after unifying China in 221 BC. That year is therefore generally taken by historians to be the start of the "Qin dynasty" which lasted for fifteen years until 207 when it was cut short by civil wars. ^ This was due to the large workforce available as a result of their landowning policies (implemented by Shang Yang), described in the culture and society section. 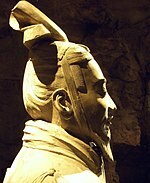 ^ As the modern Chinese habit is to include dynasty names as a surname, this became Qin Shi Huangdi. Later, this was abridged to Qin Shi Huang, because it is uncommon for Chinese names to have four characters. ^ The term "Confucian" is rather ill-defined in this context—many self-dubbed Confucians in fact rejected tenets of what was known as "the Way of Confucius", and were disorganized, unlike the later Confucians of the Song and Yuan dynasties. 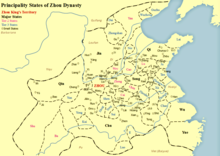 ^ "...The collapse of the Western Zhou state in 771 BC and the lack of a true central authority thereafter opened ways to ﬁerce inter-state warfare that continued over the next ﬁve hundred years until the Qin uniﬁcation of China in 221 BC, thus giving China her ﬁrst empire." Early China A Social and Cultural History, Cambridge University Press, 2013, page 6. ^ Beck, B, Black L, Krager, S; et al. (2003). Ancient World History-Patterns of Interaction. Evanston, IL: Mc Dougal Little. p. 187. ISBN 0-618-18393-0. ^ "Chinese surname history: Qin". People's Daily. Archived from the original on 10 May 2008. Retrieved 28 June 2008. ^ a b Bai Yang. 中国帝王皇后亲王公主世系录 [Records of the Genealogy of Chinese Emperors, Empresses, and Their Descendants] (in Chinese). 1. Friendship Publishing Corporation of China (中国友谊出版公司). pp. 134–135. 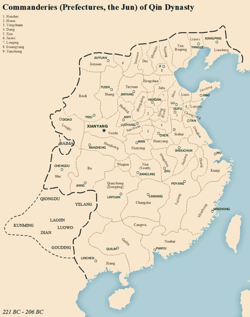 ^ a b c "China's First Empire | History Today". www.historytoday.com. Archived from the original on 17 April 2017. Retrieved 17 April 2017. ^ Nylan, Michael (2001), The five "Confucian" classics (PDF), Yale University Press, ISBN 978-0-300-08185-5, archived from the original (PDF) on 11 June 2014. pp. 29–30. ^ Bodde (1986), p. 72. ^ "Mausoleum of the First Qin Emperor". UNESCO. Archived from the original on 7 August 2008. Retrieved 3 July 2008. ^ Keay 2009, p. 98. ^ Wade, Geoff (May 2009). "The Polity of Yelang and the Origin of the Name 'China'" (PDF). Sino-Platonic Papers. 188. Archived (PDF) from the original on 30 September 2011. Retrieved 4 October 2011. "This thesis also helps explain the existence of Cīna in the Indic Laws of Manu and the Mahabharata, likely dating well before Qin Shihuangdi." Bodde, Derk (1986). "The State and Empire of Ch'in". In Twitchett, Denis; Loewe, Michael (eds.). The Cambridge History of China, Volume I: the Ch'in and Han Empires, 221 B.C. – A.D. 220. Cambridge: Cambridge University Press. ISBN 0-521-24327-0. Tanner, Harold (2010). China: A History. Hackett. ISBN 978-1-60384-203-7.